Fiber vs. Fibre – What’s the Difference? Home » Fiber vs. Fibre – What’s the Difference? Depending on whether you live in America or somewhere other than America, the way you spell your English words could be noticeably different. There are many spelling conventions that are different between American and British English. There are several reasons behind these differences. In the 19th century, many American academics yearned for a distinctly American version of English. Meanwhile, at the same time, many British linguists preferred to spell words that English borrowed from French and Latin closer to their original spellings. In the case of fiber vs. fibre, the second is likely the case. Fibre came to English from Latin through French, and the -re ending is common in French. Which version should you use? The answer, of course, depends on where you are writing. What is the Difference Between Fiber and Fibre? 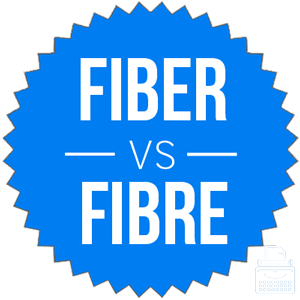 In this post, I will compare fibre vs. fiber. I will use each of these words in at least one example sentence, so you can see how they appear in context. Plus, I will show you a helpful memory tool that makes choosing either fibre or fiber a bit easier. What does fiber mean? Fiber is a noun that means strands of something. Fiber is a type of material that can come from many sources. Dietary fiber is vegetable or animal tissue that is eaten as part of food. Textile fibers can be natural, like cotton and wool, or artificial, like nylon and spandex. Carbon fiber is a material made from tiny strings of carbon atoms. Here are some example sentences that contain the word fiber. Most nutritionists encourage clients to eat a high-fiber diet to maintain regularity. Wearing clothing made from soft, natural fibers can bring a measure of comfort to children with sensory processing disorders. What does fibre mean? Fibre is the same word as fiber. The only difference between them is in their spellings. Fiber is preferred in American spelling; fibre is the preferred spelling in British English. These charts show the relative prevalence of fiber vs. fibre within both language communities. In American English, there is no contest. Fiber is clearly the preferred spelling and has been since the beginning of the 20th century. The story isn’t quite so clear-cut in British English. Historically speaking, fibre has been the preferred spelling in British English for at least 200 years, and it still has a slight lead in general usage. That said, fiber has made some serious inroads. It may one day replace fibre as the preferred spelling in British English. These charts aren’t exhaustive, however, since they only look at books published in English since 1800, at the exclusion of other print or digital sources. Still, they still illustrate a clear, long-term usage trend. These words are two different ways of spelling the same noun. Which one you choose depends on your intended audience. If you are writing for a predominantly British audience, choose fibre. Since both fiber and Denver both end in -er, and Denver is an American city, you should have little trouble remembering to use fiber in America. Is it fiber or fibre? Fiber and fibre are alternative spellings of a noun that refers to strands of material, regardless of the nature of the strands. Fiber is the American spelling. Fibre is the British spelling. Despite a recent change in British English, these spelling preferences run deep, so you should probably not mix them up in each language community. 1 What is the Difference Between Fiber and Fibre? Expresso or Espresso – Which Spelling is Correct? Saviour or Savior – What’s the Difference?